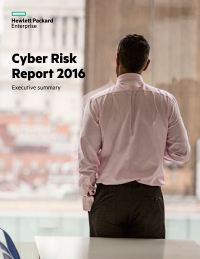 The 2016 edition of HPE’s annual security research Cyber Risk Report details a threat landscape still rife with old problems and known issues. The environment is one in which well-known threat vectors continue to exist in the digital enterprise side by side with the latest attack methodologies to steal unprecedented amounts of corporate and personal data. The report examines the nature of prevalent vulnerabilities that leave organizations open to risk, and how adversaries take advantage of those vulnerabilities. This security intelligence can be used to better allocate security funds and personnel resources to counter the threats and prepare a better breach response. Download the report to better understand the evolving nature of cybercrime, what defenders now face as they look to secure their enterprise, and how to best deploy your resources to minimize security risk.